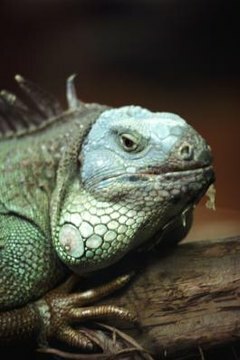 Reptile misting allow owners to provide ideal conditions for captive reptiles. For reptiles to survive in captivity, it is important to replicate the humidity present in their natural environment. Through reptile misting, owners can control the duration, frequency and quantity of water individual reptiles require. Reptile misting systems can be expensive. Build one at home to save money and even reuse household objects. Remove the lid from the pail. Drill a hole in the center of the lid with the 1/4-inch bit. Insert one end of the first piece of plastic tubing through the hole in the lid. Pull 12 inches of tubing through the lid so that 5 inches of tubing rests on the bottom of the pail when the lid is on. Cut a 5-inch piece of duct tape and tape the tubing to the bottom of the pail. Keep the tape one inch back from the end of the tube. Otherwise, the tape could prevent water from flowing though the tube. Fill the pail with distilled water. Distilled water prevents calcification, which will clog the system and inhibit misting. Snap the lid onto the pail. This now becomes the water reservoir. It will need to be refilled based on how often and how much the reptile is misted. Push the other end of the tubing onto the water pump inlet. Use an adapter if necessary. Push one end of the second piece of plastic tubing onto the outlet valve on the water pump. Insert the other end of the second piece of tubing into the misting nozzle. Attach the misting nozzle to the inside lip of the aquarium using a tubing clip so that the nozzle falls just inside when the lid is closed. Plug the water pump into the power outlet timer. Set the timer based on the amount of water this specific aquarium needs. The duration and occurrence of misting is determined by the size of the aquarium and the number of reptiles housed in it. Plug the outlet timer into the wall outlet.  Each reptile species has specific water requirements, including the duration and frequency of misting. Determine this requirement prior to assembling.  Use 100 percent nontoxic silicone sealant to attach tubing to adapters and valves if they continually slip off. ⚠ Over- or under-misting can be detrimental to the reptile's life. Over-misting can create the growth of mold or mildew. ⚠ Keep the irrigation tube remains taped to the bottom of the pail to prevent air from getting in the lines. Sarah Ruggiero began writing professionally in 2008. Her work has been internationally published in cities throughout the United States, Australia, Timor-Leste and Canada. Ruggiero received a master's degree in journalism from Bond University in Australia, as well as a bachelor's degree in public relations and writing from Juniata College in Pennsylvania.